A Complete JamPlay Review for 2014 - Does It Work? Are JamPlay’s Tutorials Worth All The Hype? Click Here To Try JamPlay RISK-FREE for 7 Days! Songs to learn are good, but was left wanting more. Thanks for checking out my Jamplay Review. This is a HUGE course and so I’m still going through it. To be real, with over 4000+ lessons, it may take a while to get through everything. I’ll keep this review updated as I go through different sections. 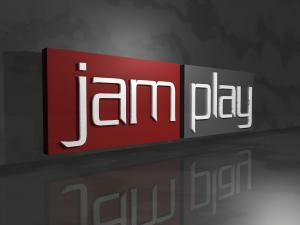 They add about 11 hours of new video each month so Jam Play will keep anyone busy! From my experience so far, though, I think this is one of the best online training programs on the internet. I also like GuitarTricks, but they both have different things so both are essential to anyone wanting to master the instrument. I’ve always loved music and knew I needed to learn. And before I learned to sing, I wanted to learn to play the guitar. I was gonna be a rockstar! I’d still play a little, but I barely knew a chord, proper pick or fret technique, or anything really. What I knew was self taught – and it wasn’t much. But it was burning inside me. I wanted to master the instrument… but with the music I loved. Not some stuff I had never heard of! Learning and playing the guitar was supposed to be fun right? But now I wanted to learn things properly. I used online singing lessons to improve my voice so I knew there was something out there for instruments too. 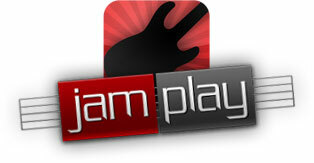 I heard of JamPlay through a guitarist friend and decided to check it out. I’d heard good things about the program so I looked into it and eventually got access to the program. I was pretty excited because everything looked super high quality. There were some great names behind the training (like Steve Stevens from Billy Idol, among others). So I eventually got access to the program and started learning. I was thoroughly impressed and immediately overwhelmed. There was so much great stuff waiting to be learned! The way the instructors teach things and the way they are laid out are perfect for beginners and advanced players. You can start wherever you want – beginning or in a particular style/skill/song. And what’s more is you can learn however and wherever you want. This program has mobile video streaming on your phone or tablet and up to 720 HD video when you’re on a computer. And you can go at your own pace. A big selling point for me because I like to keep going and going, not waiting a week for my next lesson! The best part about these lessons is you can go through at your own pace and there’s so much cool stuff to learn. So I can race through the fundamentals sections (since I know music) and get right to the skills (singing w/ guitar) and styles (r&b, funk, etc.) I want to learn about. There’s just more variety. Programs like GuitarTricks are great, but Jam Play has so many different things in terms of style to offer (you’ll see below with the in-depth overview). The only thing that left me wanting more was the fact that the types of songs available to learn. There’s tons of rock, country and stuff, but not a lot in terms of other genres. This isn’t the biggest deal because there are songs in many different genres and they add more all the time. Also, the 7 day money-back guarantee is kind of short. It doesn’t really give you a chance to run through the whole course (like other programs). But having said that, 7 days is more than enough time to sample all the content like I did and see if it’s right for you. I’ve seen huge improvements in my ability to play by sticking with JamPlay’s methods. I am playing actual chords, melodies and starting to learn entire songs. I personally like the videos and learning style involved here. I felt excited to learn stuff and didn’t feel like it was dry or boring. I try to dedicate time to practice everyday so I was able to pick up concepts and get better quickly whether it was fret movements, finger movements or overall playing ability. I have learned about playing a bunch of different music styles – rock, country, r&b/soul, folk, etc. With more practice and this site by my side, I have no doubt I’ll master this instrument. I can already play better and it hasn’t even been that long since I’ve started learning. I’ve gone through a couple courses now, but this is definitely one of the best (if not the best online lesson). Having gone through the core content and some of the specialization stuff (skills & styles) I can honestly say I’d recommend this to anyone that wants to learn guitar fast and easily. The videos and content are all top-notch and make it a snap to pick up new concepts. You have to practice, but if you do you’ll go far. Now, i do love JamPlay, but I’d also recommend going through a program GuitarTricks in addition to JamPlay. They have similar stuff, but there are some things exclusive to each program that are worth the price of the subscription alone. For instance, GuitarTricks has totally different songs you can learn than JamPlay does. On the flip side, JamPlay contains concepts that the others leave out. So I’d say if you can afford it get both (it’ll only cost you 30 bucks, and they both have money back guarantees). There are 3 initial phases of this system. But it’s not completely structured without flexibility. You actually get to choose your learning route and focus on what’s most important to you. And if you want to be an all around master, everything you could ever want to learn about playing is served up to you in high-definition video. Phase 1 is the beginner lessons. Don’t let that fool you though as there are two “beginner” sections. 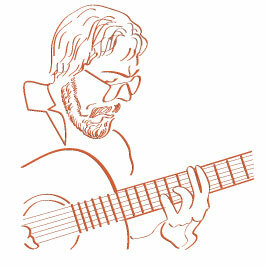 There’s one section for complete beginners who don’t know anything about playing guitar, and then there’s a section for self-taught guitarists which helps you fill the gaps in your learning. Going through these sections will make sure you’re ready to build upon everything in Phases 2, 3 and beyond. Phase 2 is really where JamPlay shines. There are so many different styles of music to learn it’s incredible. You’re literally on a gold mine of tutorials in every genre you could want to play. You’re not limited to one style, either. You can learn them all if you want (trust me.. I am!). And when it comes to different skills, you’ll be a real master when you’re done with all the different sections. Like I said, this is really the best part of the whole Jam Play system. It has so much variety and options. See, I told you there were a lot. And once you’re ready you can drill-down into specializations and skills. Did you notice the module on Studio Skills – this is the kind of stuff that makes JamPlay one of the most comprehensive courses on the planet. Not because of the number of videos (GuitarTricks has more) but because of the different things they teach you. It’s an all-encompassing course, which many others are not. Phase 3 is a nice addition too. However I did feel like the number of songs in different genres was lacking. Don’t get me wrong, there’s tons of great music to learn, and they teach you through online video along with guitar tabs, so it’s a good system. But I wish they had more songs outside of Metal and Rock. For example, if I wanted to learn more R&B Soul classics, I would only find a song or two. That’s not the worst thing in the world, though. Because you find tabs for songs all over the internet. And this program will teach you how to read tabs effectively. Here’s a quick sample of some of the popular songs they teach you. There are lots of great songs you’ll learn in the following genres: R&B/Funk, Rock, Bluegrass/Folk, Metal, Blues, Classical, Gospel, Holiday Songs, Country, Fingerstyle, Jazz and Punk. So there’s lots to learn and they’re constantly adding more. Once you’ve gone through the core lessons in phases 1, 2 and 3 you get some extra stuff that will boost you over the edge. JamPlay doesn’t stop at just the lessons – there’s an entire system in place for you to help you master your instrument. The Artist Series is pretty cool. It’s a set of lessons that are taught by specific, industry “insider” guitarists who take you into their unique styles. These guys range from major music industry session players to lead guitarists in some of the biggest bands in history. Did you ever think you’d be able to learn to play with rock-legend Steve Stevens from Billy Idol? I didn’t. But JamPlay makes that possible. There’s some awesome stuff in here, that you don’t want to miss. It’s the kind of stuff that will give you the motivation to get through the basic lessons quickly. Another little gem that comes with a monthly subscription is the Live Lessons. There are daily sessions of text chat and webcam-to-webcam video streams directly with the instructors at jam play. So if you’re thinking that online lessons can’t be as good as in-person instruction – you’d be wrong. Jamplay bridges that gap and does a pretty good job with it. Not much for me to say here because I haven’t learned how to play bass guitar yet, but I will soon. But they don’t only teach acoustic and electric, they also offer lessons on the bass. All included with your subscription. There’s a bunch of other stuff also included with your subscription. You can chart your progress with custom reports. See how you’re doing and how far/fast you’re learning. 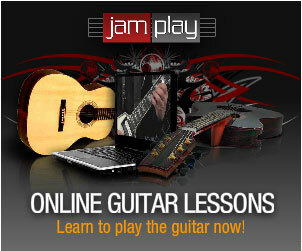 Thousands of other guitarists are part of the JamPlay community and are there to help you out. This is probably one of the most comprehensive scale libraries available online. You can see any scale in any key and a fretboard diagram. Honestly… if you’ve read this whole review of Jam Play and aren’t convinced it’s one of the best solutions available, then you just don’t want to learn guitar. JamPlay has everything you need and I found it to be really fun to go through. I am still learning, but just in the first few lessons, I’ve learned so much. I am already starting to see my skills improve. Of course, I practice. And that’s something that’s up to you. You HAVE TO practice regularly. The more you practice the fast you’ll see the results. But if you’re looking for a training program that is easy to use, and teaches you the stuff you want to know about playing guitar, then get this program. If you’ve got the budget (an additional $15) I’d also suggest checking out GuitarTricks. If you can only choose 1, go with JamPlay, but if you can go through both since they’ve both got different stuff that can help you. That’s it for my JamPlay review, but now I’d love to hear your thoughts. Have you tried this or another training program online? Leave us your experiences, comments and questions in the comment section below. And if you found this article useful, please share it on facebook, twitter, google+ or anywhere else! We love hearing from you guys! Go back to topic page.